Having been in the hog roast Surrey business for over 20 years, we here at Taste the Crackling would like to give you an insight into our world and let you know how we can help you have an amazing event with superb food that your guests will love. Hog roasts are our main requests from clients but we can also spit roast lamb, chicken or beef so the options are endless really. A spit roast is when the meat goes around and around over a flame and a hog roast is when the meat sits in a tray inside the machine. Both ways of cooking produce excellent results with the main advantage of a hog roast Surrey being that you do not need electricity for a motor so to set up the event in a field is not a problem at all. Hog roasts are also the easiest ways to cook if hiring a machine off us, this is due to the fact you can easily just switch the machine on and walk away to do other tasks and come back and your meat will be perfectly cooked. A spit roast machine does require a little bit more attention as it has more moving parts, that said it is still a simple process and well worth the effort for the razzamatazz of a turning beast on the spit bringing out the caveman in us all. Taste the Crackling has been running hog roast events in Surrey for so long now that we seem to have been to every nook and cranny of the County. We have perfected the art of getting our hog roasting equipment into and out of backyards, patios, marquees & even boats so rest assured we would be able to talk through your options with confidence and advise on the best possible cooking options for you. 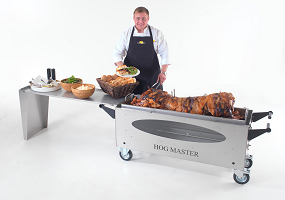 We are also a market leader in the Hire of Hog Roasting and Spit Roasting machines and can even supply you with gazebos, tables, and chaffing dishes if you so wish. 5-6 hours is the normal cooking time for a hog and this would feed 100 people comfortably and with the mouth watering smells wafting to your guests they will be very impressed with your culinary skills even though all you have really had to do is turn it on at the correct time. For a fully catered event we generally turn up to the location 8 hours before your serve time, a gazebo is set up to take out any worries with Surrey rain, tables for serving from and all the other equipment is polished and ready within a couple of hours. Our hog roast hire Surrey chef will then keep an eye on the cooking process while prepping the rest of the menu and what with a massive selection of salads, canapés & desserts on offer please do check our website menus for more ideas. After your guests have been served we will start our breakdown making sure we do not impact on your evening, rubbish is cleared away and taken with us, the area is double checked, and away we go leaving you any extra leftover meat nicely wrapped for a midnight snack if you so require. Our hog roast Surrey leftovers can be frozen for many more meals of mouth watering food with my personal favourite being sweet & sour pork, the lovely rough cut chunks being a world away in flavour from the normal shop bought stuff. We hope you enjoy our website and find everything you are looking for, the quotes if requested should be with you in 24 hours after a request is made. We have a dedicated team in the office to answer any queries and if you have any left field ideas or requests we will do everything in our power to accommodate you. Please make sure that you book ahead in summer as we normally are booked up at least a month in advance during the summer period and Saturdays are of course our busiest and most requested event days. Here at Taste the Crackling we wish you every success for your upcoming event and are always here to help.